When most still enjoy the last sunbeams, the average exotic lover is already thinking about the coming winter. 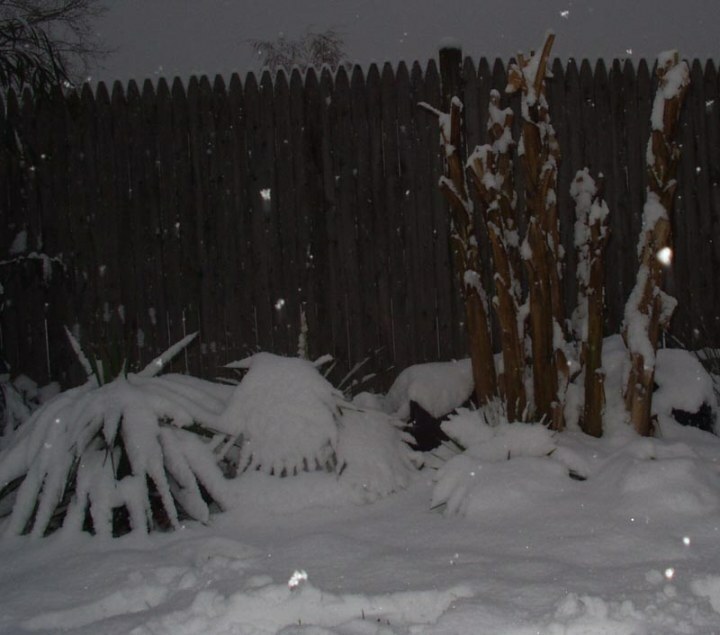 How are you going to help all those plants flawlessly through this winter again? In the months of September and October, this is often the main topic of discussion. Numerous articles have appeared on the internet about protecting a banana plant during the winter. But often these articles are only about packing as winter protection. To give a more complete overview of the possible methods, we have listed them all for you. This way you can choose which method is most suitable for you and your banana plant. Is a banana plant hardy? Some banana plants are known to be hardy. This hardiness, however, refers to the roots only. The plant stops already growing at temperatures below 5°C (41°F). From -2°C (28,4°F) the leaf freezes completely. 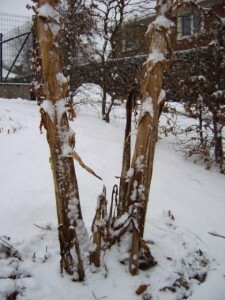 With persistent frost, the pseudo stem, which contains a lot of moisture, will also freezes. The plant then dies off to the ground and only forms new shoots in spring (April/May). In order to get a larger plant and even achieve flowering, it has to survive the winter. Four different wintering methods are discussed below. The first two methods leave the plant outdoors for the entire winter. In the last two methods the plant overwinters dry, i. e. indoors. 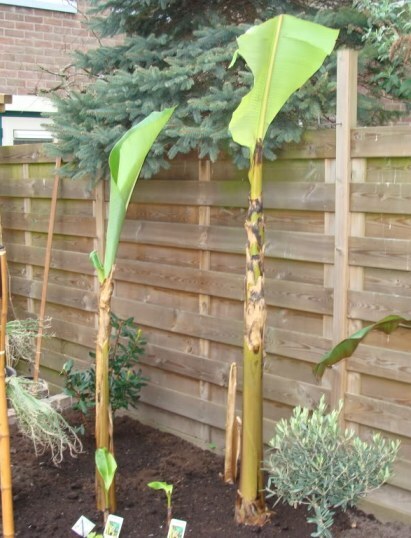 Probably the simplest, but also the most risky method is not to protect the banana plant during the winter months. Depending on the severity of the winter, the result of this method will also vary. Some species are fairly hardy, but as mentioned earlier, this characteristic only applies to the rhizomes. When frost persists, the leaf and then the pseudo stem dies to the ground. In spring (April/May) new shoots emerge again. - at colder temperatures the roots also freeze ! = Banana plant dead! A widely used and often described method. The principle is quite simple; just before the first persistent frost, you clear the stem of the leaves. After this you place a barrier around the stem (e. g. wired fence or chicken wire). Then fill it up with an organic material as straw or leaves. Hay is not suitable because it will heat up. On the outside you can fit a layer of fleece cloth. This way the straw doesn’t get wet but can keep breathing. All this is finished with a waterproof roof. This protection is also insufficient in very harsh winters. Only the thicker stems will not be frozen to the core. For plants where the stems did not survive, it is however more likely that the roots have survived and therefor will develop new shoots. (NB This method is often combined with method 4, for the sake of certainty. Fleece cloth, sold in your local garden center and DIY stores. Straw can be bought most cheapest directly at a local farm. With this less familiar method, the pseudo stem is stripped of its leaves in autumn and then dug out with all its rhizomes. If the rhizome has several stems, these can now also be divided very well. The rhizome and its stem are placed in a tub. There is no need to add any potting soil. Place it in a cool place: between 5 to 10°C is perfect. Light is not required. The water gift must also be drastically reduced. Just enough to prevent the rhizomes from drying out. Growth will come to a standstill. It goes without saying that even fertilisation can no longer be administered now. In spring, the water gift may slowly be increased again. As soon as it is warm enough, the plant can also be placed outside and fertilizers can be used again. This method allows for faster growth rates than plants that have wintered outside. 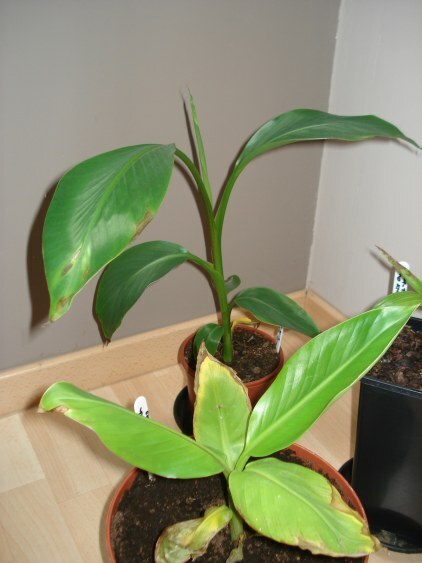 With this last method, the potted banana plant is given the brightest possible indoor location during the winter months. All the leaves are simply left in place. Reduced light intensity will reduce growth, but it will not completely stop it thanks to maintaining the higher (room) temperature. Watering should be limited to actual needs. The soil should be slightly damp, certainly not wet. You lose a banana plant during the winter more often due to too much moisture than too little! Of course, the fertilisation must also be adjusted during this rest period. As soon as the temperatures rise again in spring, the plant can be placed outside again. Remember that the old leaves have to get used to direct sunlight again. Therefore, it is best to start with a place in the shade and gradually increase the number of hours of direct sunlight. 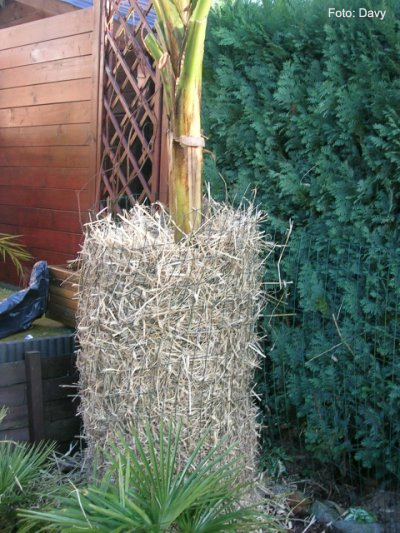 This method is especially recommended for smaller banana plants and the most cold sensitive species.